This was a period of civil strife in the Empire. It was West vs. East with Rome in the middle of it. The advisories are The House of Constantine and The House of Licinus, with the West dominated by Constantine and the East by Licinus. The coinage I chose to look at is a very abundant style of ancient Roman coinage, the bronze “Campgate”. 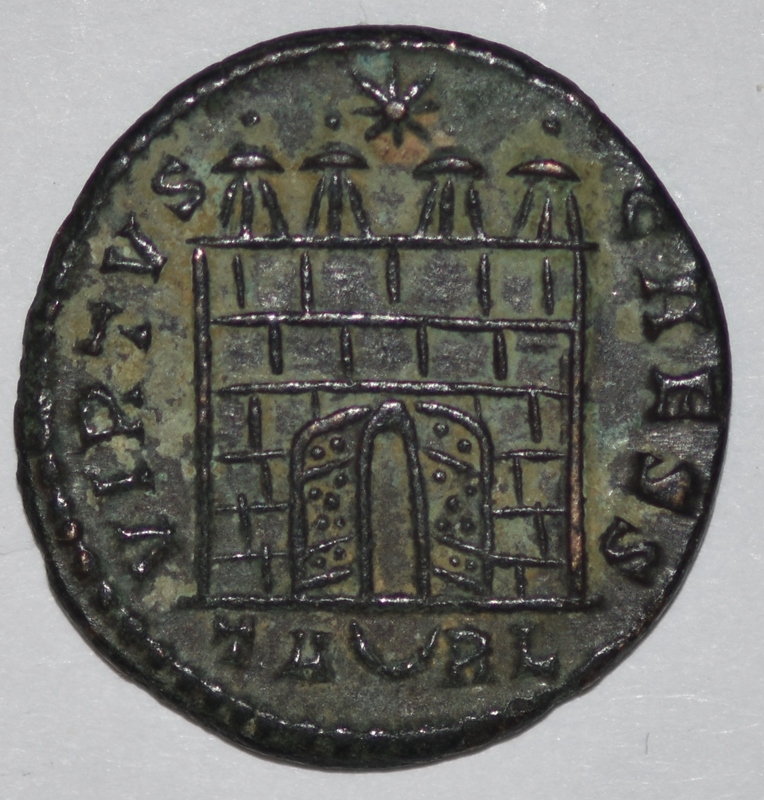 This style of coinage is earmarked by a typical reverse device, a building with turrets, doors and depicted with a massive stones wall. The walls vary greatly in construction from a few blocks wide and tall to several blocks in both dimensions, a study in and of its own right. The style of blocks also varies from plain to very ornamental again another study could be done here. One of the main points of this study was the turrets depicted on the building. It varies from 2 to 4, with the four turreted building being mainly from West and a few from Rome and the three turreted building being mainly Eastern and again with a few from Rome. The two turreted structures are used from one side of the Empire all the way to the other at all of the mints. Rome still was the focus point of the Empire so what went on in the East or West was shown in Rome as well. It is thought that the turrets were a symbol of how the communications was handled from encampment to encampment. If signals between encampments were handled with two turrets a lot of signals would have to be made to convey the message, but if three or four turrets were used the message could be conveyed with many less “digits” making it shorter and quicker. This makes it look like the West was technologically ahead of the East in their version of “FACEBOOK” of the forth century. Out of the 1228 bronze campgate style coins listed in the “Bible” for collecting Roman Imperial coins, ROMAN IMPERIAL COINAGE, Volumes I to X, most of them are listed in Vol. VII, there are 733 with two turrets, 328 with three turrets and only 167 with four turrets. Other fun facts are about the doors on the structure, there are some without doors, some with the doors closed and some with them WIDE open. I have heard stories about the open and closed doors depicting times of War and Peace, but I need to do more research to make any sense about that tidbit of information. There were six rulers depicted on this style of coinage, Constantine the Great, Crispus, Constantine II, Constantius II, Licinus I and Licinus II. There were fifteen mints that produced this style of coinage during this period. 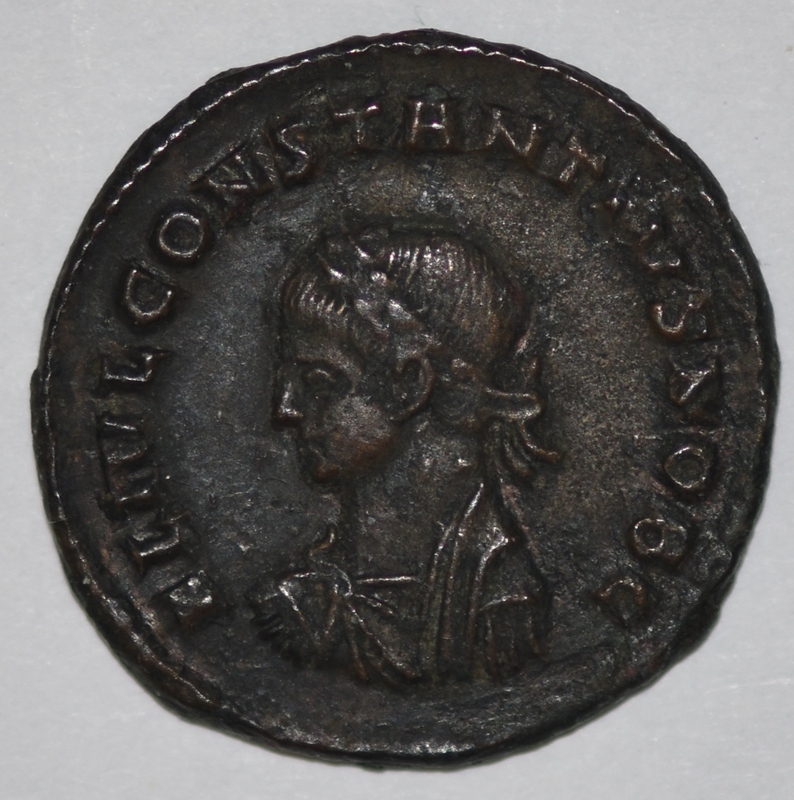 There was only one of the six rulers who had a coin produced at each of the fifteen mints and it was one of Constantine the Great sons, Constantius II. (A fun fact, I was born on his birthday 1633 years later.) That fact makes me feel that the single coin from the Sirmium mint is my key to collecting this type of coinage. Rome has close to one quarter of the various numbers of coins of this type minted in this time frame. Two rulers only have one out lying mint and Rome minting their coins. The fifteen mints are: London (24 discrete coins), Lyons (14 discrete coins), Trier (82 discrete coins), Arles (141 discrete coins), Rome (359 discrete coins), Ticinum (35 discrete coins), Siscia (38 discrete coins), Sirmium (1 discrete coin), Thessalonica (34 discrete coins), Heraclea (140 discrete coins), Constantinople (15 discrete coins), Nicomedia (93 discrete coins), Cyzicus (120 discrete coins), Antioch (100 discrete coins) and Alexandria (32 discrete coins). 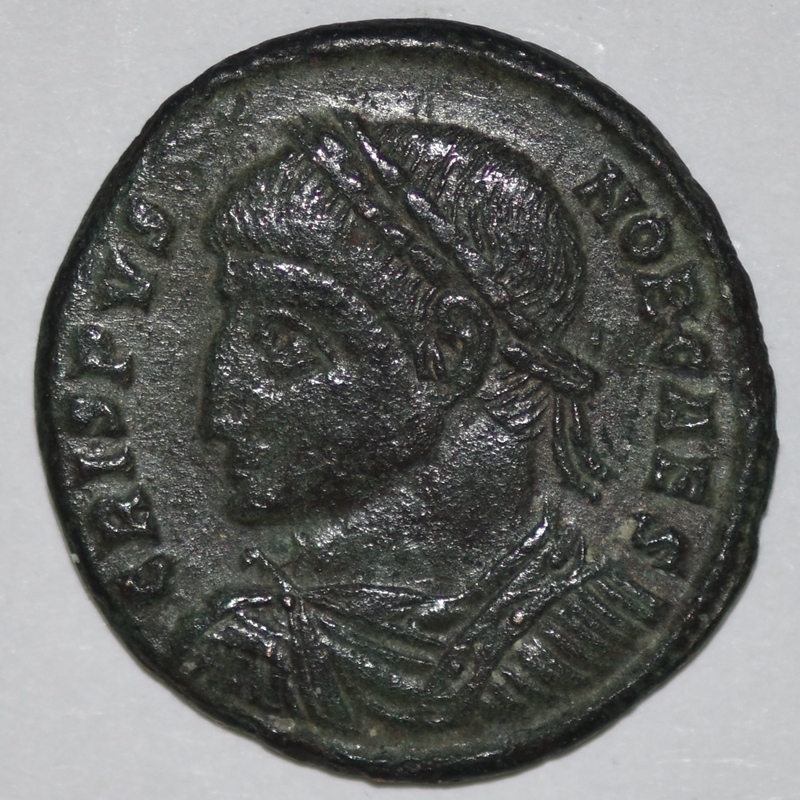 Mints that produced coinage of the six rulers as campgates are as follows: Constantine the Great (14 with 579 discrete coins), Crispus (14 with 138 discrete coins), Constantine II (14 with 248 discrete coins), Constantius II (15 with 193 discrete coins), Licinus I (2 with 40 discrete coins) and Licinus II (2 with 30 discrete coins). In my collection there are two coins that stand out for me: Number 1, my example of an Arles struck coin, RIC VII p265 292, Sear 16833, because it was the first example of a four turreted coin that I collected. 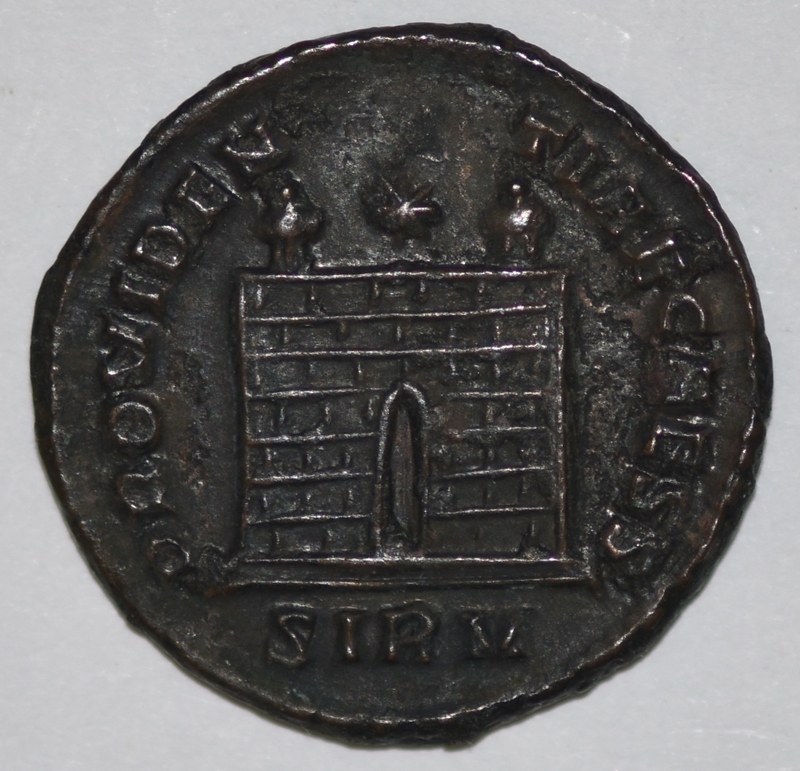 Number 2, my example of the single coin of this type minted at Sirmium, RIC VII p474 53 and not listed in Sear, because of the two facts stated above, single issue and birthday connection. Both are pictured below. Thanks for listening and if you choose have fun CAMPING. Crispus Campgate showing 4 Turrets from the Arles Mint. Some have asked: Are either of the coins pictured for sale? No, not at the present time. The site will soon be adding other campgate coins in the product section of the site.